I am now up to stitching the base for the thimble holder from Carolyn Pearce’s book ‘Home Sweet Home: an embroidered workbox’. 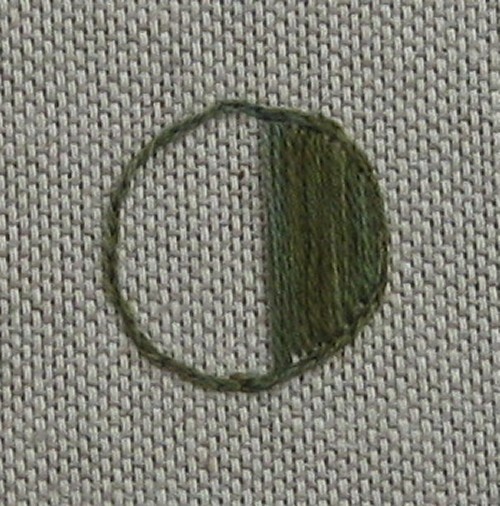 The base has a circle of split back stitches done first, to define the shape. 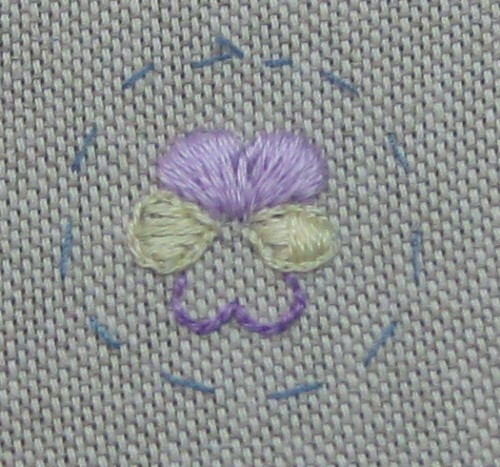 Then satin stitch is worked inside those lines. The thread is not taken ‘the long way’ across the back each time, but only a tiny stitch is made at the edge of the circle before the next long stitch is made across the circle, to cut down on bulk. A second layer is done, outside the line of split back stitch and at right angles to the first layer this time. I used Gloriana variegated silk for this, so I ended up with a softly shaded effect. Then I made a trellis of light green threads across the shape, first horizontally and then vertically. 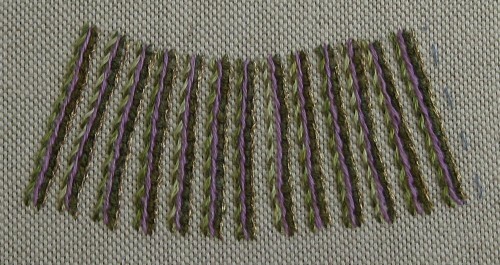 Once that had been done, I repeated that with Kreinik Very Fine Gold Braid, keeping the gold thread very close to the green thread I had laid down first. 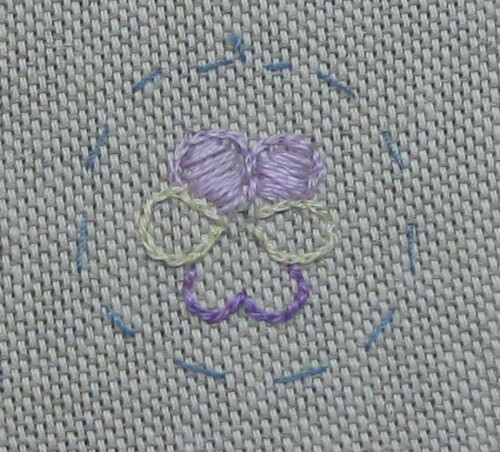 Then I couched down each intersection with deep lilac Anchor stranded cotton, using two strands. 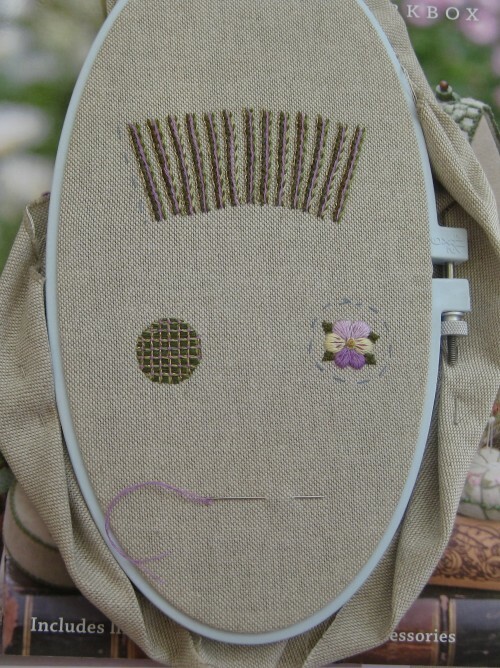 This shows my oval embroidery hoop by Susan Bates (my favourite brand of hoop), with the pieces I have stitched so far for this project. 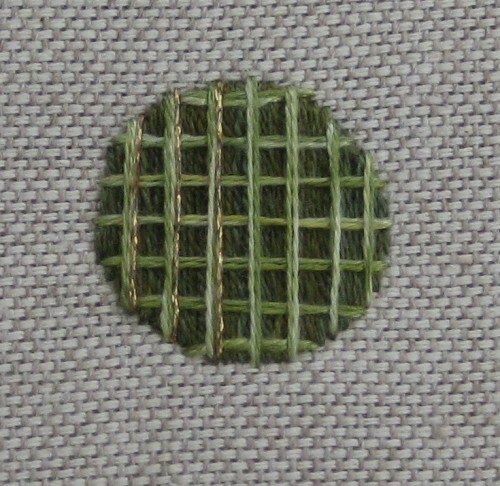 Finally, before I could assemble the thimble holder, I stitched this little motif on a piece of scrap silk, to use for the reverse side of the lid. This is only 3/4 of an inch diameter, in real life. 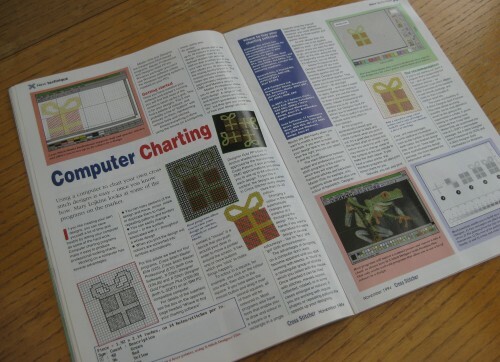 Now for the tricky part….putting it together! This week I have been embroidering the top of the thimble holder from Carolyn Pearce’s book ‘Home Sweet Home: an embroidered workbox’. The top features a little heartsease flower, and is only about an inch across. 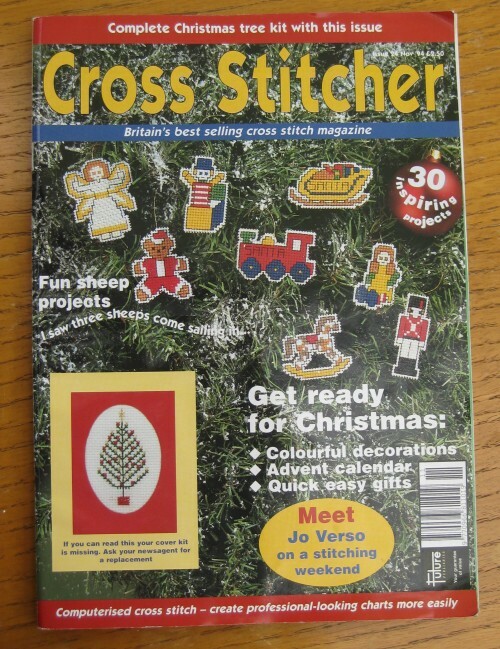 I started by stitching all the outlines with split back stitch, to define the edges. 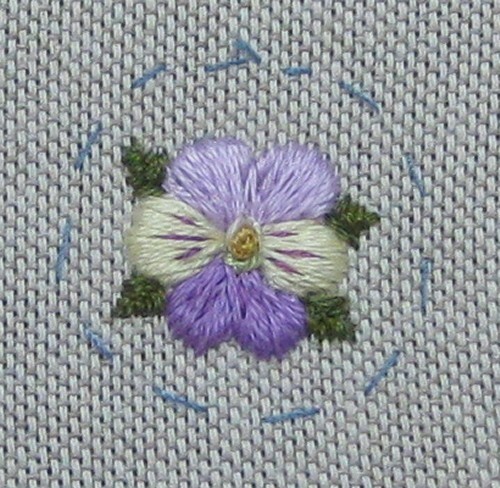 The top two petals then have one layer of satin stitch padding worked over them, inside the lines of split back stitch, before doing the top layer in long and short stitch. 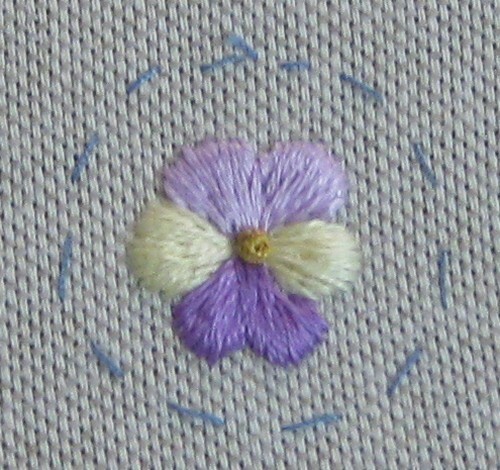 The two lemon yellow petals and the lower purple petal each have two layers of satin stitch padding (at right angles to each other) before the long and short stitch top layer is done, so that they are more raised than the other petals. 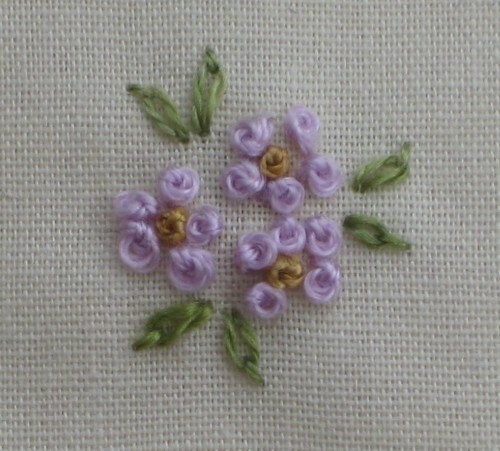 This is the flower once the long and short stitch is finished, and a central French knot is stitched in deep gold silk (sorry it’s a bit fuzzy!). 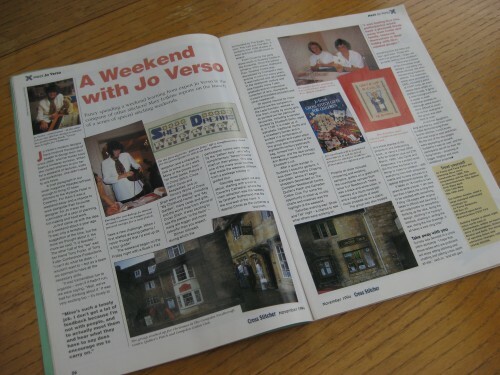 I’ve decided to tackle the thimble holder next, from Carolyn Pearce’s book ‘Home Sweet Home: an embroidered Workbox’. It’s a cute looking project, but VERY SMALL!!! Although I love embroidering these etui pieces, the assembly fills me with trepidaion, so I’ll have to see how I go with this one. The thimble holder looks, to me, like a little dustbin. 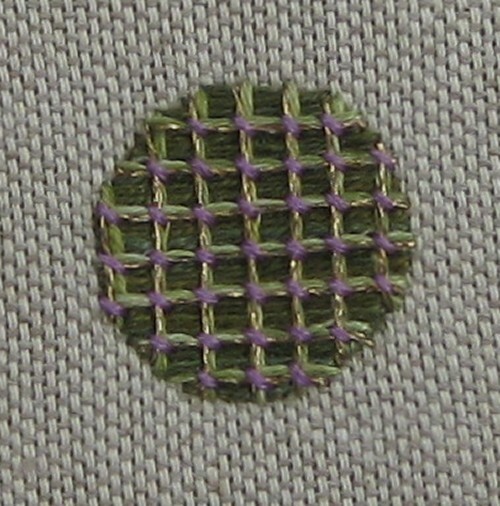 The sides are embroidered with stripes of various embroidery stitches. 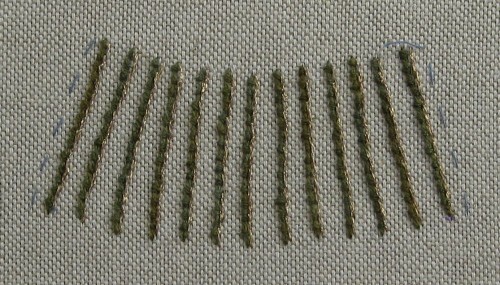 I started with stripes about a quarter of an inch apart, using coral stitch in dark green Gloriana silk. 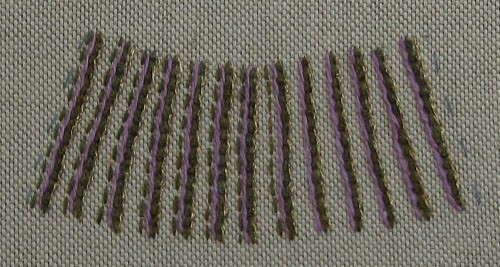 Then I worked a row of stem stitch in Kreinik Very Fine Gold Braid close alongside the coral stitch lines. 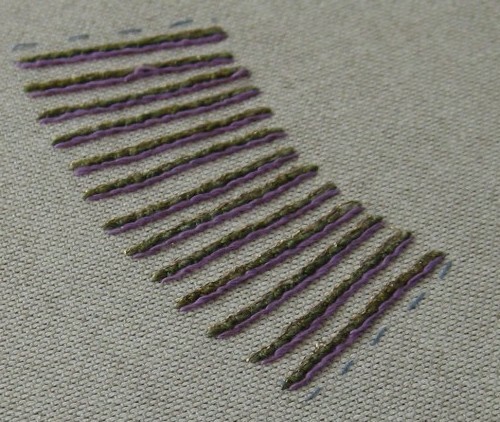 On the other side of the green coral stitch I worked another row of stem stitch, this time in deep lilac Anchor stranded cotton. Then I worked rows of running stitch in the dark green silk, leaving more of the thread showing on the top than underneath. 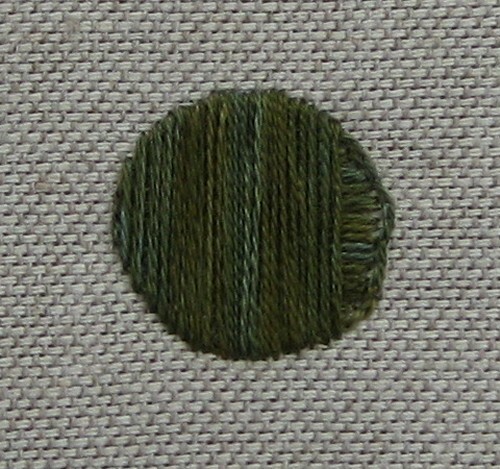 This was so that I could then whip the running stitches with a light green stranded cotton, to give a striped effect. The instructions in the book said to then do a further line of whipped stitches in the reverse direction, using the Kreinik gold thread again, but I felt that that would make it too ‘overstuffed’, so I left it as it was. I’m pleased with how this is turning out, although I was surprised how many hours it took to do! 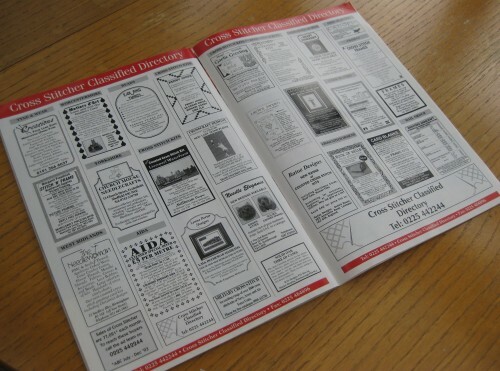 It only measures about 1 1/4 inches high by about 4 inches long.